At an average size of 400 square feet, garages are an important part of our properties. Not only do they shelter our vehicles from extremes of weather and would-be thieves, they also usually multi-task. The typical American garage may serve as a workshop, craft room, man cave, music practice studio (ever wondered where the term “garage band” originated? ), or private storage unit. The only problem with this is that throughout much of the country, garages tend to be freezing in winter and broiling in summer. 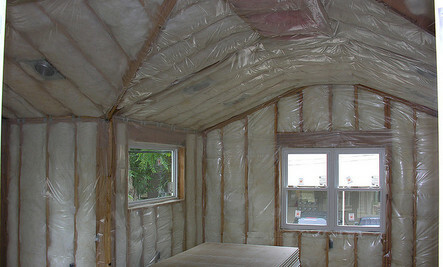 Although many people never think of adding insulation to their garage, it can be an excellent energy-wise move. To put it simply: when your garage is insulated, you’ll tend to be more comfortable working or playing in there, no matter what the season. In addition, if your garage is attached to your home, you will be preventing the loss of heat or air conditioning from the rest of your living space as well. And if you are the proud owner of a FROG (furnished room over the garage), insulation will help make the HVAC in that area perform better too. The end result is greater comfort for you and your family together with lowered utility bills. Now it could be that you’re in the minuscule percentage of homeowners or renters who never utilize their garage for anything except parking the car and storing household possessions. Even this type of usage can benefit from insulation, though. Either frigid or sultry air can be rough on your vehicle; a dead battery may result in either case. Ditto for sensitive objects that you have stashed in the garage. Extremely high temperatures will damage such things as canned goods, wine, and medication. Other stored items like house paint and electronic equipment can be equally affected by heat or cold. If you’d like the quickest fix available to help insulate your garage, try one of the kits for weather stripping the garage door threshold. These are easy to apply and will help keep out drafts, rain, or snow, and even fallen leaves or other debris. If they were not already insulated by the original builder, you can also apply insulation to the walls and ceiling of your garage, plus the access door leading into your home as a DIY project. The most eco-friendly material you could use here is zero-waste shredded recycled denim insulation, which is a more expensive but safer substitute for conventional substances like fiberglass or mineral wool insulating batts or spray polyurethane foam. One caveat: Although you may hear about using readymade kits to insulate garage doors — or applying foam board as an even cheaper alternative — be cautious. Your garage entrance is quite different from any other type of door in your home. It is controlled by torsion springs under high tension, which are precisely adjusted for the door’s existing weight. The addition of insulation and its extra poundage can cause a dangerous imbalance. For safety’s sake, consult a professional regarding insulating your garage door. Of course, when you are in the market for a replacement (garage doors have an average lifespan of about 30 years), it’s worthwhile to look for an energy efficient, pre-insulated door.